Olympic champion Eliud Kipchoge set a marathon world record, winning the Berlin race in 2 hours 1 minute 39 seconds on Sunday. Organizers initially put Kipchoge’s time at 2 hours 1 minute 40 seconds, but later reduced it by one second. Eliud Kipchoge of Kenya crosses the finish line of the Berlin Marathon after setting a world record. 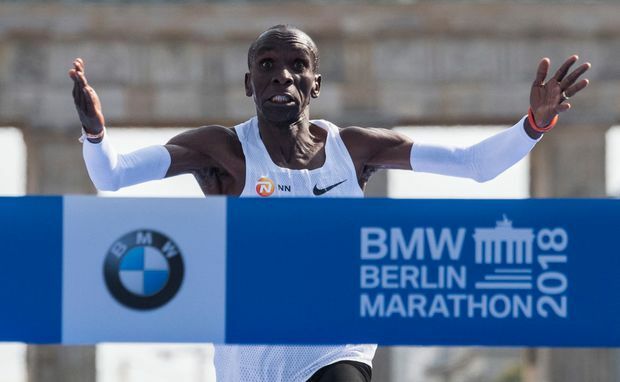 Berlin debutant Amos Kipruto came second in 2 hours 6 minutes 23 seconds, followed by a third Kenyan, former world-record holder Wilson Kipsang, with 2 hours 6 minutes 48 seconds. Shogo Nakamura of Japan narrowly missed setting a new national record with a time of 2 hours 8 minutes 16 seconds. The 35-year-old Kenyan, who has won twice before in Berlin, said she felt confident going into the race but wasn’t sure she would beat favourite Tirunesh Dibaba.